Mini display tents feature working zippers and bug screens, just like life size tents. Only mini display tents are miniature in size. 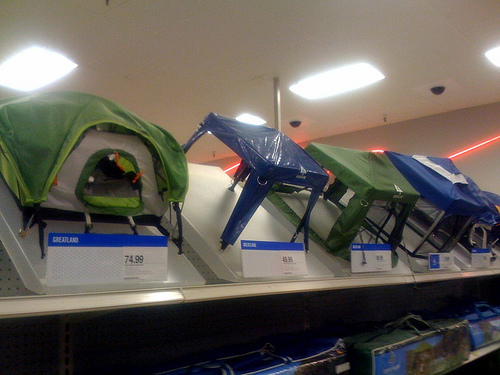 They are usually displayed in department or sporting good stores that sell tents, but don’t have the floor space to put a full-sized one up for demonstration purposes. I’ve long felt that they would make unique play houses, hiding places for my pets. Far more interesting from my perspective than the standard cat beds, at any rate. As far as we knew, they are returned to the manufacturer when the tent model is retired. However, if you are searching for mini display tents, then you have reached the right place. Learn more about Mini Display Tents. Cats love hiding places. They like the feeling of being secure from a shelter or small enclosure. Your cat will love a mini display tent just as much as the next. So what are you waiting for? Buy your cat a miniature display tent today! Shop online to buy a mini display tent for your cat. Dogs are loveable and personable. They retreat to a comfortable place and enjoy sleeping in smaller spaces. Your dog will love a mini display tent just as much as the next. So what are you waiting for? Buy your dog a miniature display tent today! Contact us to buy a mini display tent for your dog. Did you build forts as a child? Weekends spent in the basement or living room where the family room couch was dismantled and reassembled into a master fort with blankets, pillows, the works. Did you play with GI Joe or Barbie Dolls? The miniature tents we have would make a great addition to a GI Joe or Barbie toy set. Where Can I Buy Mini Tents? NOTE: Due to recent overwhelming demand, we may have temporary low stock of certain items. If an item is out of stock, back ordering may be possible. Stock levels will be shown on product page. Please contact us for any questions regarding in stock items. Mini Display Tents typically range in price from $19.99 to $99.00. There are many different styles and sizes with different features. You can order online now. Please contact us to learn more.